On May 9, 2012, the SMTC and the NYSDOT hosted a public meeting for The I-81 Challenge. Over 480 people participated in the in-person public meeting, and over 250 people participated in the virtual meeting through the project website. The feedback and key findings from this public meeting have been summarized in the May 2012 Public Meeting Summary Report, now available on the project website. 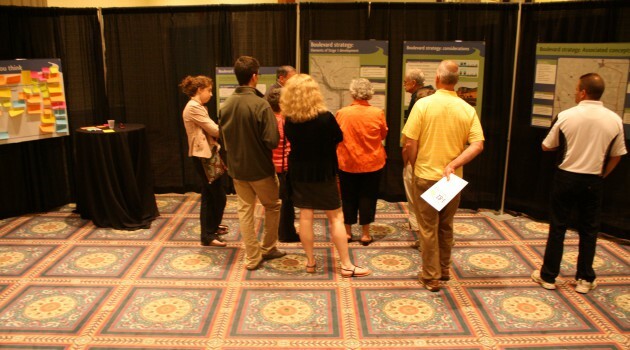 At the public meeting, participants were able to review materials from the first round of public workshops (held in May 2011), and see how feedback from those workshops was developed into initial strategies for I-81. Participants also provided input on the draft strategies for I-81, the process for evaluating potential future strategies, and long-term improvements to the regional transit system. Input from the public meeting will be used to verify that The I-81 Challenge is moving forward with appropriate strategies for the region and refine specific components of the possible future strategies. The next step is to analyze the possible future strategies to arrive at a limited number of viable options for each strategy. Public involvement continues to be an essential part of The I-81 Challenge, and the Central New York community can expect to see additional opportunities for public input in the future. Thank you for your continued interest in The I-81 Challenge !